Enola's name backwards spells "alone," and alone she is, in the world's biggest, darkest, dirtiest city. She is being hunted down by the world's most famous detective -- her own brother, Sherlock Holmes. For the sake of freedom she must elude him, but what can she do to ease her loneliness? When she discovers a hidden cache of brilliant charcoal drawings, she feels as if she's a soul mate to the girl who drew them -- but that girl, young Lady Cecily, has disappeared without a trace. Braving midnight streets where murderers roam, Enola must unravel the clues -- a leaning ladder, a shifty-eyed sales clerk, political pamphlets -- to find the left-handed lady, but in order to save Lady Cecily from a powerful villain, Enola risks revealing more than she should. Will her own lonely heart betray her? 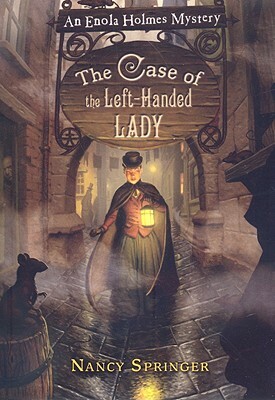 In this second installment of the acclaimed Enola Holmes Mysteries, two-time Edgar Award winner Nancy Springer brings us all the danger and intrigue of Victorian London as she continues the adventures of one of the wittiest and most exciting new heroines in today's literature.